Intertex Tunisia 2019, International Exhibition of Textile Industry. 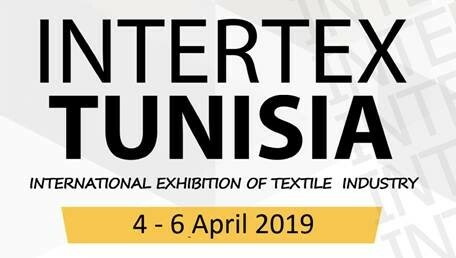 Intertex Tunisia 2019 will be held from 4 to 6 April 2019 in Foire international de sousse Fair Ground in Tunisia. Intertex Tunisia Fair will provide a great opportunity for export value and sales growth to international companies along with the participation of domestic and international textile professionals and will be welcoming high-quality products from different countries. It will provide you with an opportunity to meet new customers. The Exhibition is ready to welcome all textile manufacturers to Tunisia. Delegations and professional visitors from 18 countries; mainly from neighboring countries such as Italy, Spain, Portugal, France, Morocco, Algeria, Egypt, Nigeria, etc. Intertex Tunisia exhibition is full of opportunities for exhibitors and visitors to do business on a global scale. Intertex Tunisia is an international platform where sector professionals are able to meet each other and develop their network. Intertex Tunisia is the where that you can discover thousands of trendy products of widely known brands and chain stores. Over 10.000 industry professionals come together at same platform with over 300 specialized B2B meetings.